People are big on “Water Flossing” these days. So much so that the trend has picked up and is the talk of the town. I’ve seen many brands put out Water Flossers recently. They talk big when it comes to the features. But are they worth it? I intended to have a look. Okay, let’s quit the chat and bring out the litmus test. No, I’m not joking. 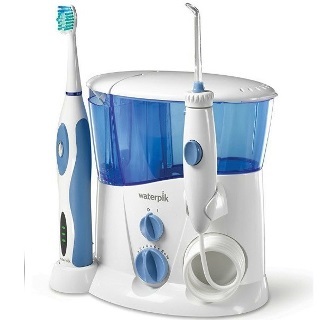 Let’s put Waterpik’s dental products to the test. I intend to do a “Waterpik WP-100 vs WP-660 vs WP-670 vs WP-900 vs WP-950” comparison. Naturally, I’ll be documenting what happened with me in short reviews. I’ll be putting everything in these reviews. Yes, the good, the bad, and even the ugly about these five products will be there. People can look at the pros and the cons of each flosser before pushing the “Buy” button. I’ll be directing the focus on a comparative analysis on how each of these things work. Measure each one’s color options, space-saving capacities, additional features/attachments, and above all… performance level against the other before making the decision. WP-100 vs WP-660 – Which One of the Two Wins? 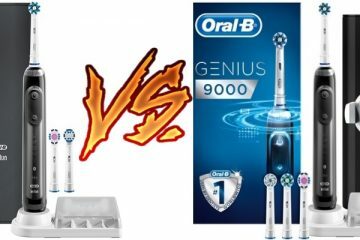 WP-660 vs WP-670: Who’ll win the Neck and Neck Battle? The design of this unit might not account for much but believe me, it does the job. Modern-day flossers might have a big reservoir but they tend to leak water all over the bathroom counter. On the other hand, WP-100W is the old warhorse that comes with a bowl that contains the reservoir. If any amount of water leaks (it would never happen, believe me), the bowl is there to contain it preventing it from hitting the ground. I found a storage case with the model. To tell you the truth, it helped me in keeping the flosser tips organized. These things are hygienic so that people can share these among family members. Another good thing about the storage case is that it doubles as the lid on the unit. You’ll find four flosser tips inside the storage case. These are separated and alternatively positioned in a way that the part which goes into your mouth doesn’t touch the other. I liked the reservoir as well. It holds up to 22 oz. of water. It’s good for 90 seconds of flossing. That is IF one runs it at the highest possible setting. But remember to mix a certain quantity of water with the solutions for the flosses to have any effect at all. Don’t worry, it’s all written down in the manual. That’s not it! The unit is flexible when it comes to filling it up with water. Fill it up with a pitcher or take out the reservoir and use the sink for the job. Your choice. This little device comes with a 4-feet power cord. It’s never too far away from any power outlet of a bathroom. Waterpik WP-100W is also great when it comes to controls. The mechanism is simple! You have the On/Off switch. There’s a regulator as well. You can see 10 levels that you can cycle through. Each level increases the pressure precisely up to 10psi. I’d advise users to go as far as 90psi so that things remain under control. To make sure that operating this machine is simplified further, you have a handle with a switch. It’s attached to a cord. The coiled cord stretches up to 2 feet. Water travels through the cord to the tip of the Just press the blue switch on top and the water flow will come to a pause. Thus, you can position the handle better for a better cleaning experience. The one beef I have with the WP-100W is the fact that it has rubber feet. These feet can pose problems when you drag the thing across bathroom counters. These things can leave a mark. The unit is compact and lightweight. Reservoir and lid on top function very well to say the least. I could experiment with different pressure settings to achieve perfect flossing experience. The power cord and the handle cord are of sufficient length so that people can feel at ease. People can enjoy 90 seconds of flossing at the peak of this machine’s ability. It’s a win! I could have flexibility by my side when working with the handle while repositioning the flosses. I’d not lie to you. If you’re a beginner, this machine will take some getting used to for sure. Now that we’re down with WP-100W, I want to turn our focuses on WP-660. This one is pretty special in its own right. I’m not the only one singing its praises. This thing comes with ADA (American Dentist Association) approval signifying its quality and benefits. First of all, you have a compact design that looks good on any countertop. Trust me, the sleek design will charm each and every user. Simple on and off switch makes operating it easier than ever. Then you have the pressure control system. It allows users to customize the flossing experience even further. People can take advantage of as many as 10 different pressure settings. The pressure intensity ranges from 10 to 100 for the users. Don’t worry. Everything is there at your fingertips. The next thing that caught my eye is the covered reservoir. It’s big! It’s competent enough to hold water essential for 90 seconds of flossing. That’s more than enough, trust me. I’ve not even begun to comment on the flossing tips. You have three jet tips for general flossing with WP-660. There’s a toothbrush tip as well. It helps when you want to brush your teeth while flossing. Then, there’s a tip for people with braces. A pik pocket tip is there to help with periodontal pockets as well. Don’t forget the plaque seeker tip that helps you in combating with plaques. That makes it seven tips in total. It’s “Total Care” according to me. Oh, one can store these tips inside the unit itself. Would you believe me if I told you that this little machine features just “Two” flossing modes? Yes, just the two. Apparently, Pulse Modulation and Hydro-Pulse mode does the trick. Pulse Modulation is good for removing plaques. Feel free to do a minute of flossing every day and find out for yourselves. I almost forgot to tell you about the Hydro-Floss Massage Mode. This nifty addition massages and stimulates our gums. This keeps gums healthy. Those of you who know about the anatomy of our teeth also know that a good massage improves blood circulation. It helps in keeping the teeth healthy. One can switch between these two modes with the help of a single switch and an LED display. Don’t know how long to use the flosser? There’s a 1-minute timer to help you. Also, a 30-second pacer will help you flossing each side of the jaws. Trust me, the timer and pacer threw guesswork out of flossing. The unit is ADA (American Dental Association) approve. This tells you about the standard Waterpik sets. However, there’s one catch. You can’t use the unit outside North America. You have a sleek design to work with that elevates any bathroom people use it in. As many as 7 different flossing tips work together in favor of our teeth’s hygiene and well-being. I loved the covered reservoir and a competent flossing tip storage inside the unit. 10 Pressure modes and two flossing modes give a range of options for the users to experiment with. The makers pledge whiter teeth inside just two weeks with good reasons. This unit is a bit noisier than other Waterpik products out there. Flossing tips don’t lock in one place and can spin in the direction you’re flossing. Waterpik WP-670 is a step up from the earlier model in some respects. The design is quite similar. Yet, you’ll notice small improvements in the reservoir section. I felt the water storage compartment is sturdier in this case. The water flow rate is an improvement as well. It gives out 400mL per minute. 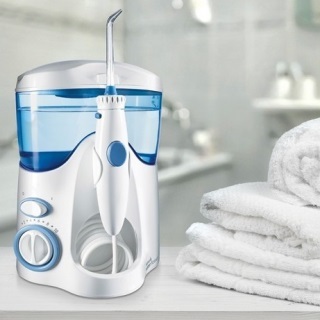 As you know by now, Waterpik 670 is famous for 7 types of flosses. Three of them are normal Jet flosses. There’s one Pik Pocket tip for dental implants. You’ll also have an Orthodontic tip to take care of the dirt in between braces. There’s also a Plaque Seeker tip to take care of the plaques. Don’t forget the regular toothbrush tip as well. It mimics the brushing action. People can keep these flossing tips on the top of the reservoir. But the elegance doesn’t stop there. You have a separate storage case for these things as well. Inside you have separate compartments. One can choose to operate with pressure settings as well. These settings have as many as 10 steps to work with. Feel free to choose from 10 to 100 PSI. One kit is enough for the entire family. Just be sure to adjust the pressure according to the age and tolerance level of the person using it. Remember, I told you about the reservoir? It has a big belly. So much so that it stores water eligible to complete 90 seconds of flossing. The good news is; you don’t need that much time. 1-minute flossing per day will do just fine. There’s a 30-second pacer in place. You don’t need to guess when to turn the other way. People have access to two flossing modes here as well. The standard floss mode takes advantage of Pulse Modulation. It works to remove the plaques. Hydro-Pulse Massage mode works towards gum stimulation and improving blood circulation process. Feel free to switch between the modes with touch on a switch. There’s an On/Off button on the body. You have the same button on the handle to make it more convenient to the users. The handle is ergonomic in design as well. It helps us to grab the unit and navigate it around the teeth and the jaws easily. Last but not least, this thing comes with an ADA approval as well. This is a seal that represents safety, user-friendliness, and the effectiveness of the unit. I loved the fact that this unit provides an extra case to hold the flossing tips with great care. As usual, you have 10 different pressure levels to work with. Change the settings with a regulator. Seven flossing tips come handy when it’s time for various types of applications and scenarios. LED panel makes it easy for people to get a grip of what’s going on inside the flosser. ADA Approved unit is a seal of trust and performance for years on end. It’s a big unit for people who’re not used to countertop flossers esp. the big ones. Floss tip storage is inconveniently placed below the water storage’s lid. If you want something extra from your water flosser, try and get WP – 900. It comes with the Sensonic Toothbrush. The first thing I noticed here is the design. It’ll save you a lot of space on the counter. Yes, even with the flosser and the toothbrush in tow. For convenience, you have On/Off button on the handle. You can use the two-product combo with a single outlet. You don’t need to plant a second outlet just for the brush itself. That means, saving electricity is no longer a problem. WP-900 comes with flosser and a brush as you all know. 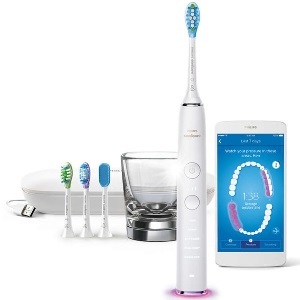 The Sensonic toothbrush promises us 25% faster brushing and cleaning thanks to the flosser that’s there. The brush facilitates “Under the Gumline” brushing. It brushes “To The Spot” thanks to the precision bristles as well. These bristles are fast! The brush has its own set of control with a high and a low setting. Ergonomic handle allows for a good and comfortable grip on the user’s part. You have the 2-minute timer and a 30-second interval for everyone’s convenience of using the device. It comes with an additional brush head. Before I forget, the brush comes with a premium-quality travel case as well. This is to ensure that when you carry the device separately, it doesn’t get damaged. When it comes to the flosser itself, you have 10 pressure settings and a regulator to switch between them. There’s an “On/Off” switch as well. It has a cord at the end of which flossing tips get attached. As far as the flossing tips are concerned, you have two jet tips with the product. That’s one less than the others. There won’t be a toothbrush flossing tip as toothbrush is already there as a part of the kit. So, you have five flossing tips in total to deal with. Consider the additional toothbrush and it’s a gold mine. People have the reservoir to contend with. It holds 90+ seconds of flossing water inside. What caught my eye is the additional tip storage. It is designed to keep each tip separate from the other to maintain proper hygiene and care. Thus, the tips can carry on flossing for a longer period of time. You need to periodically clean the unit to maintain the level of performance that you desire. For that, load warm, clean water in the reservoir. Then add one table spoon of vinegar into the mix. Turn the unit on and point the tip(s) towards the sink. Running the reservoir empty will clean the tip(s) in question. Just rinse and repeat the process. Do it every two or three months to maintain the hygiene of the unit. You get an additional toothbrush with the unit and five flossing tips making it one of the best. Two toothbrush heads give people option of having a spare head in case of damages. The reservoir holds water used to floss for more than 90 seconds without breaks of any kind. This design saves you a lot of space on your countertops in the bathrooms. The brush holder on the unit can be used to recharge it while people use the flossing kit. People won’t be able to experiment too much with the toothbrush’s speed and controls. Have some money to spare? Why not by a quality product from Waterpik? Get yourselves the WP-950 Complete Care 7.0. This one has a Sonic brush in tow too. What I liked is the tip storage at the side of the reservoir. It doesn’t eat on the reservoir’s capacity. You’ll have the same 90+ seconds of flossing water. Like I said in the case of the previous product, it won’t require an additional power outlet to run the brush. Just the one will do. It saves valuable space on the bathroom counter and the wall. As you know, this thing comes with a Sensonic Sonic toothbrush with high and low settings and an On/Off button on the body. Ergonomic handle facilitates anti-slip gripping when working with this unit. Oh, you have two standard brush heads and two compact brush heads instead of one just one. People can charge this brush with the help of the main flossing unit. It has a dock system in place for that. As far as the battery life goes, I found the battery going on for more than five days before needing the next full recharge. It’s a beast in my opinion. The brush is better than Sonicare FlexCare as it removes 70% more plaques than that unit according to me and many other users out there. 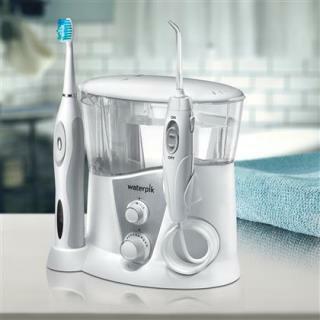 In addition to that, you have five flossing tips usual with the WP-900 series that take care of the business. These tips have the Hydro-Pulse massaging mode and the normal Plaque Removal mode as well. Both of these modes work well with dental implants and braces, bridges, and veneers. This little flosser has received ADA (American Dental Association) approval as well. It promises to remove 99.9% plaque when in operation (I doubt that). Besides this advert line, one can expect maximum plaque removal due to superior technology and state-of-the-art dental care as a whole. My only beef with such an advanced model is the fact that you can only use it with 120V outlets. That means, you can only use this in North America. In fact, Waterpik has prohibited any shipment outside. Although you have five flosser tips to work with, these tips are nothing short on performance. The reservoir holds water that’s 90+ seconds worth of flossing. Incredible storage system. You get to keep all the flossing tips separate from each other inside a section for hygiene purposes. ADA certification is a big help in case of a device like this. Anyone can use this knowing its safe. If you need any, waterpik has replacement brush heads ready. It already comes with four of them. I’d not lie to you; this product is big. I mean, really big in terms of length. The water pump which brings liquid to the flosser tips, can be loud for people like me. 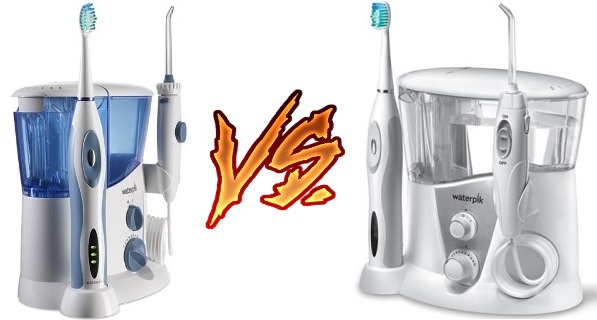 Ready for the grand battle of the flossing systems? I guess you are! Without further ado, let us get into the nitty and gritty. Let’s compare all of these models one against the other and see which one comes on top. 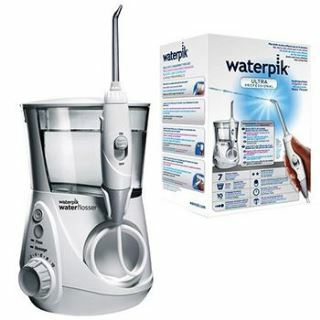 Waterpik WP-100 flosser is the entry-level unit compared to WP-660. This is only on the surface. Let me tell you one intriguing fact about the earlier model. It’s the most compact unit under budget. I believe this unit is the perfect one for a beginner to get started with the brand. It helps to clean all your plaques before you actually pay your dentist a routine visit. On the other hand, WP-660 is one of the best when it comes to flossing units. In fact, this thing is ADA approved. I was surprised to know that WP-660 is the first of its kind to have been granted this certification. People also have 10 pressure settings to work with. Also, the reservoir delivers 90+ seconds of flossing when you need it. Comparing WP-100 and WP-600 is an intriguing task. No matter how you look at things, both models are awesome. I’ll give WP-600 just a bit of an edge just because it has an additional flossing tip besides the two we see in the case of WP-100. Feel free to use it as a replacement tip. If you have an extra member in your family, great! Use it for him/her. WP-100 comes with 10 pressure modes from 10 – 90psi. But WP-660 slightly ups its game when pressure is concerned. You have 10 pressure settings starting from 10 PSI to 100 PSI. But I doubt that users with a sensitive set of teeth would even need this much pressure. The WP-660 comes with a Hydro-Pulse massage mode. This massage mode helps in improving the blood circulation process in the gums. Improved blood circulation process helps in preventing gingivitis and gum sensitivity for people. If you are wondering, WP-100 doesn’t have the Hydro-Pulse mode. These two models may look similar on the surface yet there are minute differences that only a trained pair of eyes (like mine) can spot. Let’s go through them one by one. The latter model comes with a separate tip storage case as well as a designated place aside the reservoir that we all see and love. Waterpik WP-660 doesn’t have that at all. No matter where you store them, the tips remain hygienic and can be used for a long time. I don’t know if people will consider this a major difference or not but WP-670 comes in more colors than WP-660. You’ll find WP-660 in white, black, and blue. Add Tea and Pink with the existing colors for WP-670. To a lot of users, it won’t make any differences. But it makes flossing a fun activity nevertheless. 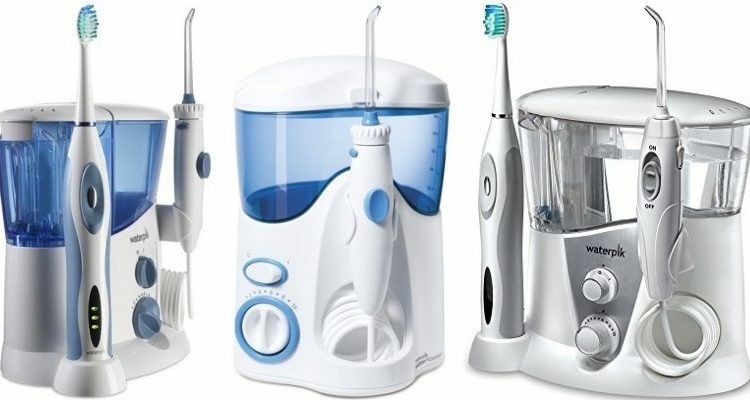 These products belong to the upper echelon of flossers as far as Waterpik is concerned. You have to pay a substantial amount of money to get these. Naturally, you’ll have more features and their benefits to play with. For example, you’ll have less flossing heads but an additional Sensonic toothbrush with each. If one has a careful look at the controls, you’ll notice a water controlling valve in case of WP-950. WP-900 comes with a water control switch rather than a valve. One subtle difference regarding the brushes is in the designs. 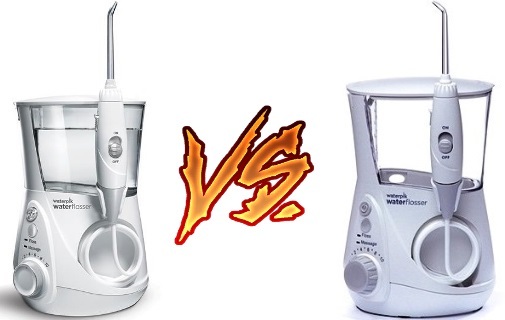 The 950 flosser’s Sensonic is sleeker than that of Waterpik WP-900’s. The silver coloring is like the cherry on top of a cake as well. You don’t need to buy an extra brush and the units eliminate the need for extra space on the bathroom counter. Furthermore, WP-950 claims to be more space saving compared to that of WP-900 even with all these items. It’s lighter too. For example, WP-950 is only 2.45lbs. but WP-900 weighs 3.2lbs. The reason I brought up brushes is the fact that you have two brush heads in tow with WP-900. But Waterpik WP-670 comes with four of them (two standard and two compact ones). These brush heads will suffice for an entire family of users. Yes, you can store flossing tips at a side of the reservoirs. But the 950 is different for a reason. It allows for the users to have a separate storage case for the tips. It’s portable as well. In this, the tips remain separated. Their business ends don’t even touch each other. It’s completely hygienic. Need more differences? The “Hydro-Pulse” massaging mode is available in case of WP-950. The 900 doesn’t have that. With its help, you can massage gums and the underlines. This way, there won’t be any threat of gingivitis and blood loss while brushing. 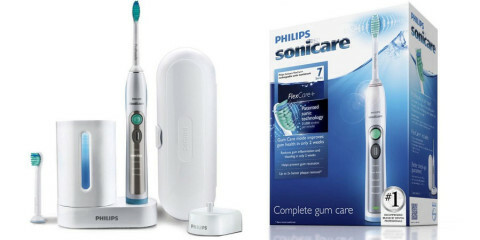 People with sensitive teeth and gums will be benefited by the latest of the two models. There’s an age-old saying that I hold dear to my heart. That is, “The more honey you pour into the drink, the sweeter it gets.” If you have money to pour in, by every definition buying WP-950 will be an awesome call to make. It has all the features and flexibility that users seek. 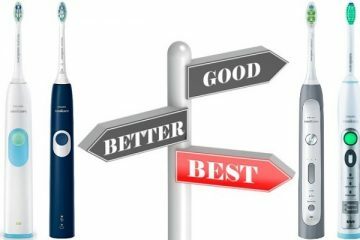 For people who are just getting to know a water flosser, it’s safe to go with WP-100. It’s conveniently priced. Also, you’ll have the core features that every user pictures in a flossing system. It even has a variable pressure mechanism for people to take advantage of. For an “Entry-Level” product, seven flossing tips are blessings to have. Mid-level shoppers can always go with WP-670. It’s always a better choice than WP-660. Separate storage case for the flossing tips helps. Also, for a few more bucks, you get to choose from two additional coloring schemes. As I said, it might not mean much but who doesn’t want to make flossing a fun thing to do at the start and at the end of the day. 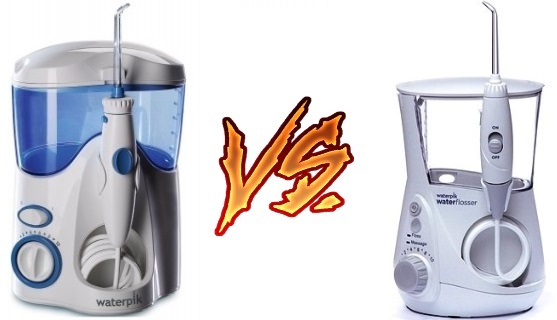 I think my Waterpik WP-100 vs WP-660 vs WP-670 vs WP-900 vs WP-950 comparison went well, didn’t you? In here, I’ve dealt with my own experience of owning each of these units. From these reviews and an in-depth comparison, people will be able to draw the line between different price ranges. These products you see, come from a reliable brand. Waterpik is known to take care of its customers. Despite the differences, these products are largely similar as well. The extra perks and benefits you see, are only advisable if you need them. Evaluate your needs and get to know each product before you decide.